When I first played Taito's 8-bit port of Fukio Mitsuji's classic quarter-muncher, I hated it. The top three reasons for my malignity: the Famicom (or, rather, NES) version's backdrops lacked the depth of those seen in its big brother, its fruit sprites weren't as well drawn and it featured a metric ton of flicker. A few months ago, I gave the game another chance--after realizing its enemy sprites, at least, were pretty respectable recreations of their arcade counterparts. I'm glad I did, because the experience forced me to recognize that this version of the game successfully (and surprisingly) reproduces two of the most important aspects of the original: its addictive gameplay and its awesome soundtrack. Sure, there are a few quirks here and there--the main one being that bubbles sometimes float through the ceiling when they shouldn't--that keep me from calling it "perfect." (An accolade I'd use, without hesitation, while describing its arcade cousin.) 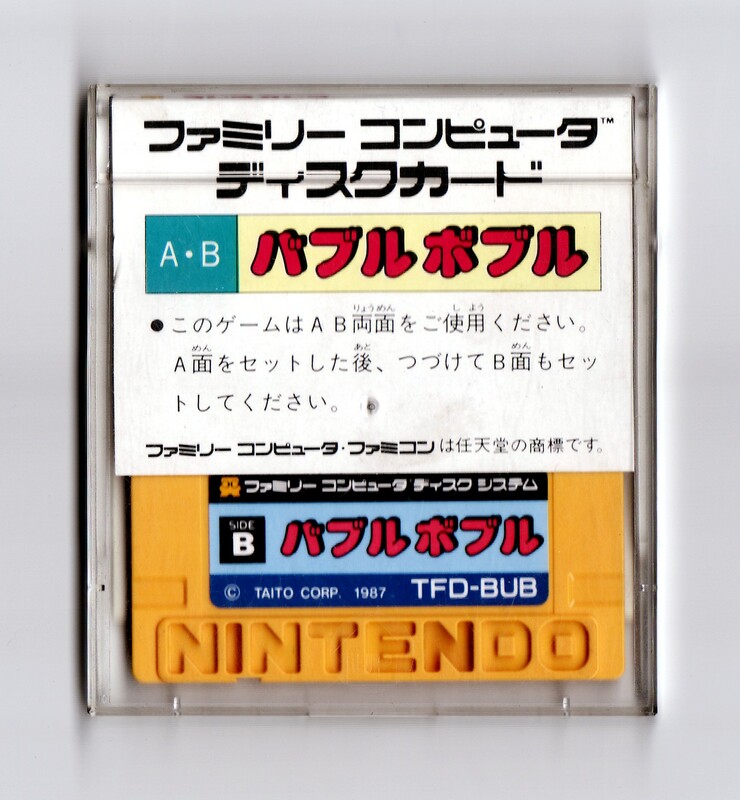 It's close enough to that pinnacle, though, that I believe it's well worth buying if you own a Famicom, NES or Wii (it's available for sale via this last system's Virtual Console). 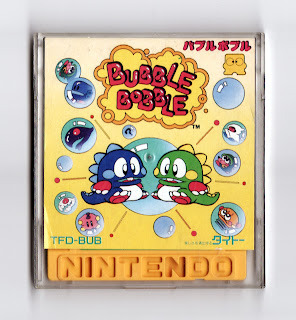 An having only played the NES version, now I'm curious about the backdrops and how the bubbles are actually supposed to act...hm. Regarding the backdrops, well, the arcade version's backdrops have a subtle three-dimensionality to them, while the Famicom/NES versions are flat. Also, I think the arcade version's tend to have a bit brighter and have more color and detail. Here's a screenshot from the Famicom/NES version -- http://www.consoleclassix.com/info_img/Bubble_Bobble_NES_ScreenShot2.jpg -- and here's a screenshot of the arcade version -- http://img709.imageshack.us/i/bubl0001.png/ -- for comparison's sake. 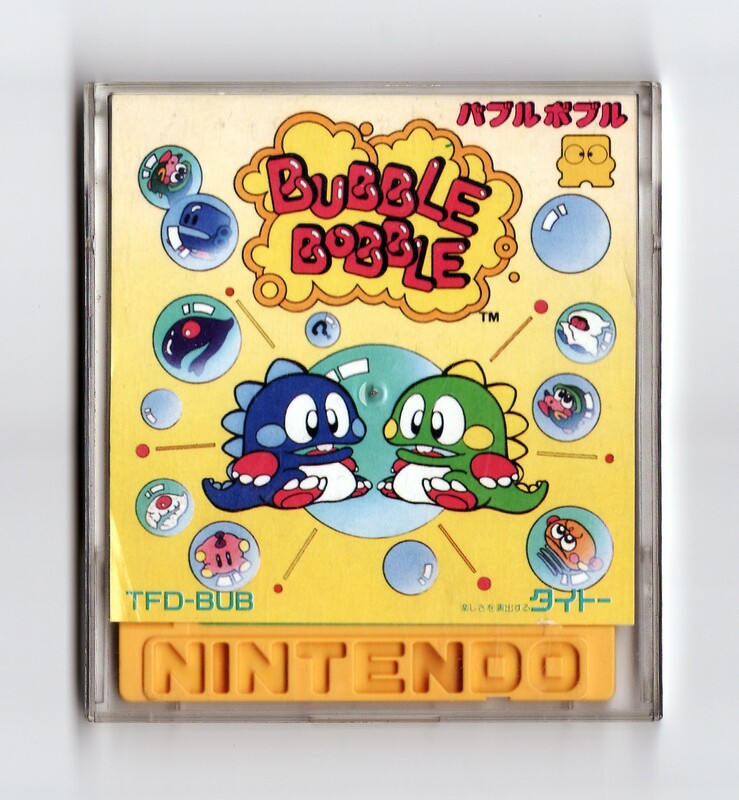 As for how the bubbles react, the best example I can give is that, while playing the Famicom/NES version, some of the bubbles go through the ceiling and then waft up through the bottom of the screen. 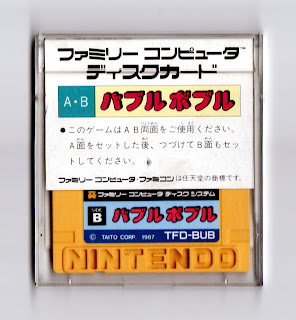 In the arcade version, they stop and collect at the top of the screen. Why does that matter? Well, the bubbles going through the ceiling in the NES version can make it impossible for a player to combo-kill a large group of enemies (since some of them float through the ceiling along with the rest of the bubbles). Strangely, it doesn't happen on every stage, just some of them, so I'm not sure if it's some sort of bug or quirk or what. It doesn't ruin the game for me, but it definitely annoys me. Well, in a lot of levels, isn't it kind of necessary for the bubbles to pass through and loop so you can jump on them to get up the screen? I always thought that was intentional. Maybe I'm crazy. I see the differences, though, now. Thanks! Oh, sorry, I wasn't completely clear in my last response. Yes, you're right that there are levels that have "open" ceilings (and sometimes floors, too) and in those levels the bubbles are supposed to pass through the top of the screen to the bottom, like you said. There are other levels, though, that have closed ceilings and floors -- the first and second levels/stages come to mind -- and in those levels the bubbles are supposed to collect at the top of the screen and stay there (not loop through to the bottom of the screen). At least, that's what they do in the arcade version. Anyway, that allows the player to herd bubble-encased enemies to the top of the screen and then pop them all at once for big bonuses. It's difficult if not impossible to achieve those same bonuses in the NES version because it doesn't always allow you to herd enemies in the same way. Ha! No. I gotcha. I know that when too many bubbles are up there, sometimes they don't stick with the others, that much is true. I guess I just never realized how they were supposed to act. I'll have to find another version to play. Don't let that stop you from playing the NES version, though; it doesn't show up on every stage, and even then I wouldn't say it ruins the experience. Heck, right now the NES version is the one I play the most -- mainly because it's sitting on my Wii dashboard (or whatever that's called). Oh, no way! It's the only version I truly know and one of my favorite games of all time! Of course I won't stop playing it! Ha ha! Good. I certainly wouldn't want anyone to stop playing this game because of those comments. Oh, I *know* you like this game, RetroKingSimon -- I've seen the screenshots you took during your recent playthrough.